ON-SITE Sales & Marketing has been a valuable source for lenders to market and sell troubled subdivisions . . . with great results. Additionally, the principals have been involved in the marketing and sales of hundreds of communities representing thousands of homes throughout their careers, beginning as front line sales people, sales managers and as a VP of Sales & Marketing for an international developer. 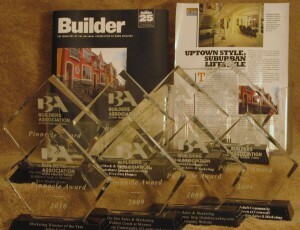 Our company and many of our communities have been awarded numerous awards from the Builders Association. Not only have we been awarded “Marketing Director of the Year,” but have received awards for “Community of the Year,” Sales Person of the Year” and “Model of the Year,” among receiving other accolades from the Builders Association.